For cyberpunk it’s a little like film noir: The term can relate to a genre, a style or a series of themes, or else to a collection of works. As a genre, cyberpunk is hardboiled science fiction that does not focus on the universe but on the environment of the near future, paying special attention to the relationship between the ‘real’ world (mainly the city) and the ‘virtual’ space of information and electronic media. But the term can also denote the aesthetic of futuristic film noir or a contemplation of imminent technological and social developments. Cyberpunk is, more than anything, the universe of William Gibson’s novel Neuromancer (1984) and Ridley Scott’s film Blade Runner (1982). This conglomerate of themes, styles and works was quickly assimilated into ideas on city and architecture. William Gibson’s ‘cyberspace’ in particular – a parallel, hallucinatory universe comprising conceptions of information – was seen as a welcome update of existing ideas on the relationship between information and the spatial environment. In addition, cyberspace promised designers a seductive expansion of their field of activity. And lastly, cyberpunk suggested that controversial issues like the demise of public space coincided with the advent of the information era. Consequently, in the 1990s quite a substantial body of literature was published relating to cyberpunk, -space, -architecture and -cities. The fact that the architecture journal OASE wishes to examine in 2005 how ‘architecture is used and represented in science fiction and especially cyberpunk (cyberfiction)’ certainly whets one’s curiosity. A fair amount had been prophesied in the 1990s about the digital future of architecture and urban planning, so perhaps it was time for an evaluative review. 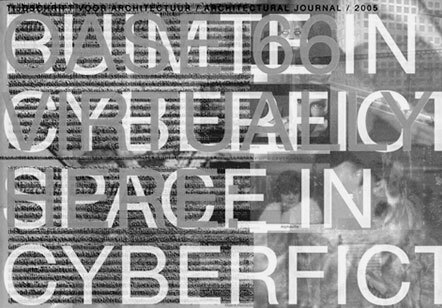 However, the editorial section suggests that the problems are fresh and developing full out, and advances a number of questions and perspectives: cyberpunk’s vision of the future with its images of the future architectural environment and its pronouncements on the perception of architectural space is a potential starting point for a reflection on the relationship between reality and virtual reality; cyberpunk as a new science fiction genre reflects a ‘cultural swing’; because science fiction and architecture comment on the future, they are fundamentally related and closely interconnected; the digital era confronts architecture with ‘issues’ which are worth exploring. It would be unfair to judge this issue on what it does not do, rather than what it presents, but for the fact that the topics and in particular their grouping sound very familiar. And, as was the case in the past, the common ground does not lie in the development of one set of problems, but in a shared, sometimes rather obsessive fascination with a relatively small corpus of books and films. Three contributions (by Gül Kaçmaz Erk, Lara Schrijver and Sidney Eve Matrix) address the representation of (urban) reality and virtual reality in one or more science fiction films. Schrijver opts for panorama, the other two adopt close readings. An interview with Michael Okuda, a set designer for Star Trek (the kind of science fiction film that cyberpunk abhorred) deals with the way an aesthetic of what will happen in the future comes about. Although the articles vary as regards quality, together they outline a fragmented history of the fictional portrayal of the future – the universe – virtual space. Scott Bukatman has, for example, described it better and in more detail, and his history is not necessarily related to the digitalization of architectural or urban space. That particular theme is prominent in the three contributions which derive from the discussion of the 1990s. Neil Spiller, like many of his predecessors, takes a neologism from Gibson’s work as the metaphor for a design strategy, and the result is complete nonsense. An abridged chapter from one of the most prominent books of the 1990s – Christine Boyer’s Cybercities (1994) – reveals that this type of literature does not mature well. The editors might (or should) have taken the new edition for a critical reflection on the history of their subject matter, also because all the literature concerning cybercities (and so on) provides a perfect opportunity to evaluate the impact of cultural studies on the architecture debate. It is indeed striking that cultural studies jargon barely puts in an appearance in the third contribution, the interview with Bruce Sterling, a pioneer of cyberpunk. But the interview does present a number of themes charting cyberpunk in a relevant way: not cyberspace and hybrid identities, but the urgency of ecological thinking and the role of branding (the topic of Gibson’s latest book, Pattern Recognition) in the city and architecture. As is the case with visionary projections of the impact of radicalism and terrorism on the city and its functioning, these cyberpunk themes are not just challenging and inspiring for architects, but are truly urgent. And because it is so hard for these themes to get into the architecture debate, that is exactly where cyberpunk’s potential relevance for architecture can be found. After all, these topics confront architects with their responsibility for things that really matter. Maarten Delbeke (Belgium) is a fellow at the Department of Architecture and Urban Planning, Ghent University.